Winter brings with it dark nights which can reduce visibility of both yourself and your dog and a good way to aid your walks is to carry a torch or buy reflective dog collars and leads, or collars and tags and Led rings, that light up. Especially useful if you have a a darker coloured poo. You can buy cycle arm bands which are realtively inexpensive that light up ,you can wear one yourself, or place round your dogs neck or collar or attach to harness or bag etc... You can get ones that fasten using velcro.The usually have dual light mode for static lights and flashing. Cockapoos love their walks and most enjoy walking and playing in the snow. 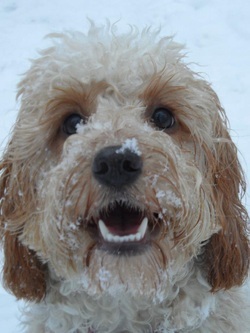 There is lots of fun to be had watching your Cockapoo play in the snow. 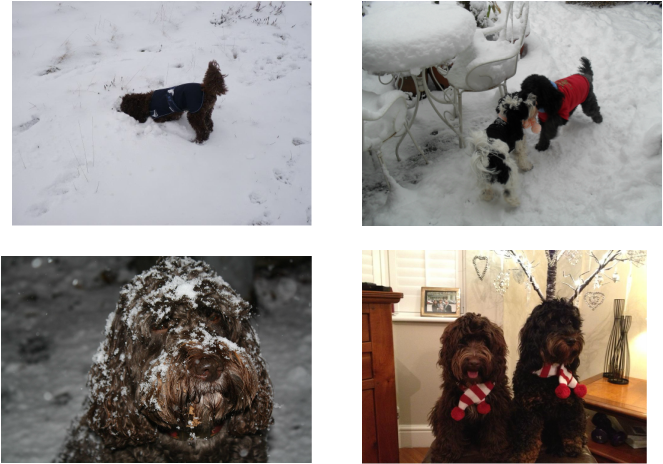 The downside however is that snow and ice clings onto their ears, belly, legs and feet and as they walk or play and as it progresses you are not walking a Cockapoo but a snowman! 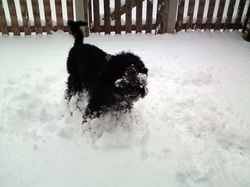 The snow and ice stick to their hairs and this causes particular problems with the paws. Lumps of ice often mixed with rock salt that the councils have put down and gravel and debris can build up between their pads and toes and this can be painful. Rock salt and chemicals laid down by your council are also toxic .Do not let you dogs chew off the ice that has formed as it may contain rock salt or chemicals and will be ingested this way, and is toxic and can cause . Rock salt, or sodium chloride, ingestion can cause high blood sodium levels with symptoms including excessive thirst, dehydration, diarrhoea, vomiting and lethargy and in severe cases, convulsions and kidney damage, liver failure and pancreatitis. if you suspect your dog has ingested , contact your vet without delay. ADVICE : Give their paws and belly a good wash/ wipe after walks. Dry thoroughly. Please also be careful of antifreeze and de-icers which is also toxic to our pets if ingested. Please store anti freeze aways from pets and clear up any spillages. Ethylene glycol, as it’s officially known, is highly dangerous. It is sweet tasting and palatable and even a relatively small quantity can cause potentially fatal kidney damage. In the early stages, your dog may appear drunk. If you know or fear your dog has ingested ethylene glycol ( antifreeze) contact your vet immediately. It may be beneficial to give the paw hairs an extra trim in the colder months to help prevent snow and ice from sticking and debris. Always check paws after walks incase of impacted snow. During Winter you may have to do extra grooming as snow and ice and damp conditions, using towels to rough dry them, along with the wearing of some coats, fleeces and knitwear may cause more matting. Especially check areas like neck , legs and armpits, which are hot spots for matts to appear. * Be aware of where you walk your dog...keep away from ice ponds, lakes and rivers as ice can crack and your dog can become come trapped in ice cold water. We wouldn't advise playing on icy patches or throwing balls near ice as dogs can easily slip an have an injury especially to legs or back or spine. Try spraying some olive oil or coconut oil onto areas such as legs and tummy that you dogs get build up of snow to help prevent snow from sticking and having snowballs to contend with. 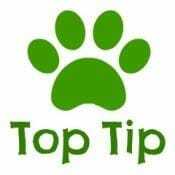 Be mindful of the length of time out with your dogs and ensure that you keep a check on there paws as when there is snow it is difficult to see what lays underneath it. Mushers : Protects paws from sand, hot pavement, ice and salt with all natural 100-percent wax-based cream is an easy-to-apply formula contains vitamin E to moisturize and help heal wounds and keep paws healthy. When you get home it is easy if you immerse your Cockapoo's legs into a bowl of warm (not too hot as this could be painful) water and defrost them! As you do check their paws and pads for any cracks or damage and ensure that the foot is nice and clean and free from any salt or other de-icers. You can buy balm for the dog's feet ( see above) or use some Coconut oil to put on after if they are a bit sore and dry. 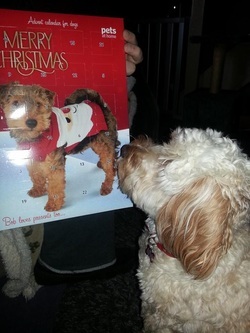 There are items your Cockapoo can wear which will help although many men usually gasp in horror at the thought of taking dogs out in any item of clothing, so be prepared for reactions girls! 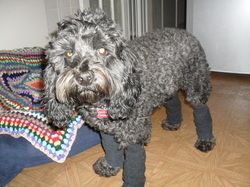 Dog Boots: You can buy dog boots which are especially handy for those dogs who do have really sensitive paws, although some dogs finding walking on them strange. Dog all in one suits: You can buy dog all in one suits where the legs are completely covered or covered half way down. Check out Equafleece or Zooplus. Dog Coats: A wide variety is available on the market ranging from waterproof to fleece type coats and jackets. Most coats are normally bought by measurements where the dog is measured from the neck to base of tail. Ebay can be a good place to snap up some bargains! Also the club shop on facebook where members can sell outgrown dog bits to each other. The other problem with autumn and winter walking is the dark early nights. Those who own dark coloured cockapoos especially may wish to buy reflective clothing. You can get collars and harnesses that have reflective strips in them and jackets that have reflective banding or piping. Some jackets are completely reflective. Please stay safe when out walking in the dark. Christmas Trees: Watch out for ornaments that can be pulled off and eaten causing internal blockages or choking , cuts to mouth and paws etc...the same applies to tinsel that can be ingested. 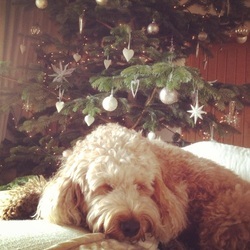 Broken/smashed ornaments can cause injury to paws. Think about placing ornnaments at the top out of reach and leaving the lover branches bare. Fairy Lights: Dogs may chew the wires which can cause shock, burns to paws or mouth or electrocution.Watch out for chewed wires. Where possible keep wires tucked out of way or use cable coverings. Candles: Be aware of lit candles which an inquisitive nose or tail may find! a waggy tail can easily catch a lit candle causing injury and or for the candle to be knock to the floor and at this time of year there are more flammable items in the home. So make sure they are placed out of dogs reach. Christmas Plants: Be aware of Poinsetta, Ivy, Azaleas, Amarylliss, Holly and Mistletoe ( especially the berries) which can be toxic. Poinsetta can cause stomach irritation from just a small part of the plant. Also be careful of Pot Pouri. If you suspect your dog or pet has chewed on or ingested ANY poisonous plant or substance, you should seek veterinary advice immediately. If possible, take a sample of the plant or substance with you to show the vet. 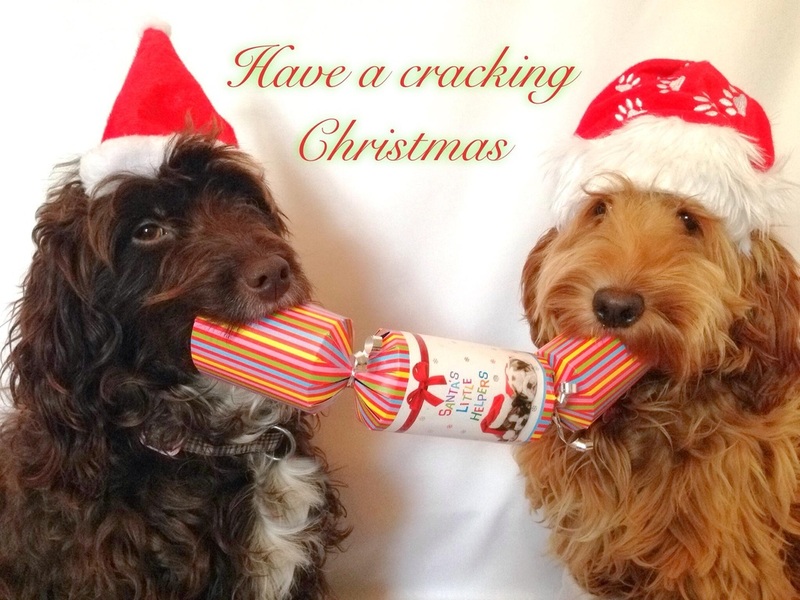 Dogs will find brightly coloured wrapping paper enticing, watch they don't ingest too much paper causing internal blockages, be aware of things like glue which can be toxic. When wrapping with ribbon or string etc...be aware that these can be dangerous. They can become caught in your dog’s intestinal tract and cause lacerations on the inside of your dog’s stomach and intestines. If your dog does swallow this they will show symptoms for depression, sickness, and begin vomiting. Should your dog swallow a piece of ribbon or tinsel call your vet . Chocolate: Chocolate contains theobromine, a toxic agent that can cause vomiting, diarrhoea and heart rhythm disorders. Large quantities can lead to death. The worst chocolate contains the higher percentage of coco beans used and cooking chocolate.So be aware of where you place your advents calendars, stockings and chocolate ornaments and boxes of chocs. Alcohol :Can effect dogs like humans but will have an effect much quicker. This can cause vomiting, diarrhoea, loss of co-ordination, depression and if ingested in large quantities coma and death. Turkey and Goodies: Raw bones are fine but NEVER feed your dogs cooked bones. Cooked bones Can cause blockages and intestinal punctures. Symptoms are severe pain and vomiting.So be mindful of your turkey and ensure your dog cannot get to the rubbish bin and help himself to any left over dinner. A bit of cooked turkey dinner is a lovely treat for them, just don't overload you dog with too much rich food as can cause pancreatitis if too high in fat or upset tummy. "I am going to have to get one"
"who has eaten all my pies?" But at least your safe and sound.